Update: The jury acquitted on all counts. Congratulations, Geoff and Gerry and Van! The U.S. District Court jury returned its not guilty verdicts Monday afternoon in the case against the 57-year-old Fieger, of Bloomfield Hills, and 46-year-old Ven Johnson of Birmingham. It heard 18 days of testimony, then deliberated over parts of four days. “I’m very pleased with the American system and the jury. I thank the jury for listening. 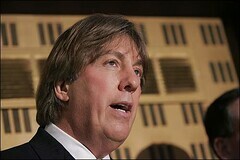 I hope this puts an end to political prosecutions in the age of Mr. Bush,” Fieger said. It looks like Fieger's biggest liability is his mouth. Today's headline: "Gym owner says Fieger called him an 'idiot' for speaking to FBI"
Southfield attorney Geoffrey Fieger raised his voice to the owner of his gym and called the man an idiot when he learned the man had spoken to FBI agents who were investigating him, Fieger's criminal trial in federal court was told Wednesday. Shant Gharibian, owner of Exclusive Fitness in West Bloomfield, testified Fieger told him "he must be some kind of idiot" to talk to the FBI. "He raised his voice and yelled at me," Gharibian said. But under cross-examination, Gharibian testified Fieger never told him to lie to the FBI and Fieger told him he believed the reimbursements were legal. Good luck Geoff and Gerry.